"In the middle of the night, between the lights and shadows of a rich house, a cold-eyed killer consumes their crimes. After caught in his sleep a boy and a woman, sits in the living room of the house where he awaits the arrival of his real target. Preceded by the barrel of his shotgun, an old and mighty man bursts into the room ready to strike, but finds himself unprepared for the truth that hides the identity of the murderer." 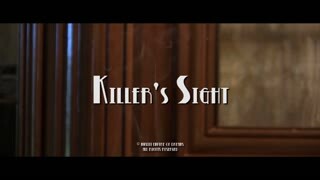 This is the synopsis of "Killer's Sight", my new short film made with no budget, born from the ashes of the much more ambitious and at the moment economically unfeasible "A Drink to Die". A tribute to American noir, always one of the film genres that intrigue me most, "Killer's Sight" inherits some of the essential characteristics of the genre: so here's a story lived almost entirely through the eyes of the protagonist (except for the final sequence), characters stuck in unwanted situations, a plot that only solves part of the questions, a photography that surrounds in the shadows environments and characters. Even the title can be seen as a small tribute to Stanley Kubrick's "Killer's Kiss". Shot mostly with makeshift equipment (lighting has been made with the lamps from the living room and so on) I tried as much as possible to remain faithful to my original vision, but having finally rethink several scenes during shooting and cut other during the editing process. Several choices have had to collision with practical problems and this has led to some decisions: for example the desire to shoot in low light which hit certain predetermined points, made me opt for more than one occasion for the presence of a video noise more pronounced , rather than having a more accentuated light. Despite having taken more time than expected, I wanted to make some real main titles that accompany the first trumpet solo of "Summertime" by George Gershwin (in the version sung by Louis Armstrong and Ella Firtzgerald), song that is the background to the short film: the trumpet soloist has always had a special relationship in the nusical accompaniment of the noir genre, as can testify, for example, the scores by Jerry Goldsmith for the legendary Roman Polanski's "Chinatown" and the excellent Curtis Hanson’s "L.A. Confidential". Everything was shot in 1080p 25fps with a Canon HV30 with Raynox lenses (a wide angle DCR-6600PRO and a telephoto DCR-1541PRO) using a tripod Velbon DV-7000, while post-production was done using Adobe Premiere Pro CS6 for editing and Adobe After Effects CS6 for visual effects, on a computer based on a Intel Core i7-2630QM processor. During shooting was taken into account that, in post-production, the final aspect ratio would have been 2.35:1, obtained by cutting a captured original image in 1.77:1. As for the sound, while having available an external microphone Rode NTG-2, the lack of an external support on which record the audio separately in order to obtain a satisfactory sound, has prompted me to make a new audio mix on the original track, using sampled sound effects separately. To accommodate the different cut, editing were also made on the soundtrack. The decision to summon two members of my family for the main roles is to be found in the precise intention to have mature and lived faces, that were able to fit in with the light and the atmosphere selected. The final result is dirty, rough, and obviously improvable below different points of view and in this sense I look forward to my next project.